In a previous tip we talked about Alternates which, in essence, are separate bids covering specific tasks that the customer decides to either add to or subtract from the base bid before starting the project. This week’s tip covers Part 2 – Breakouts. leave it’ decision, but are rather information the customer can use to finalize their plans. To create a Breakout from takeoff, highlight the entire assembly or a single item and click on the Breakout button on the Toolbar and give it a name or accept the name given. Qty Divisor is the divisor used to calculate a per unit price. IntelliBid uses the quantity in the first item in the Breakout list. For example, if the Takeoff contained a quantity of 2 for a fixture, the Breakout would calculate the cost per unit and the retail price per unit and divide by 2. Edit the QTY Divisor number and then click the Calculate button to see the effect on Cost (per Unit) numbers and Retail (per unit) numbers. Labor Rate is your hourly rate. This is your Sell price. The Markup percent only applies to Material, so be sure your labor rate includes markup. Edit this number and then click Calculate to see the effect on the Retail (per unit) Labor. Material Markup is the markup percent that will be applied to the material unit pricing. Markup is expressed as a percentage of the total; so if you want to add a 30% markup, change the Markup value to 1.30. Edit this number and then click Calculate to see the effect on the Retail (per unit) Material total. 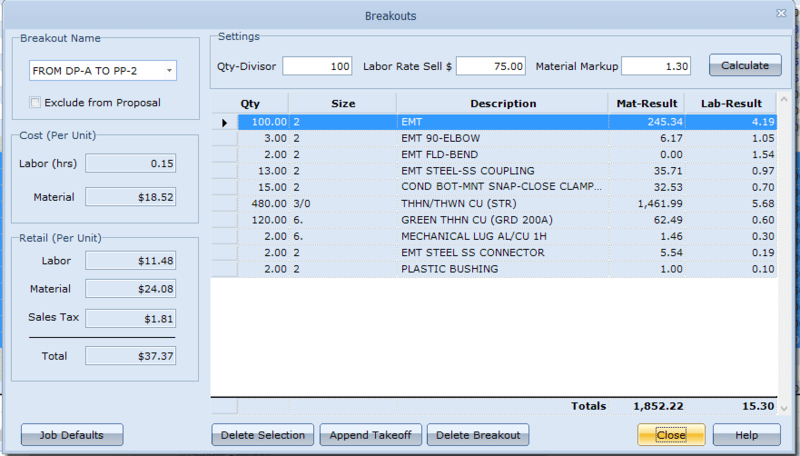 Cost (per unit) displays the Material and Labor cost of the items in the Breakout. 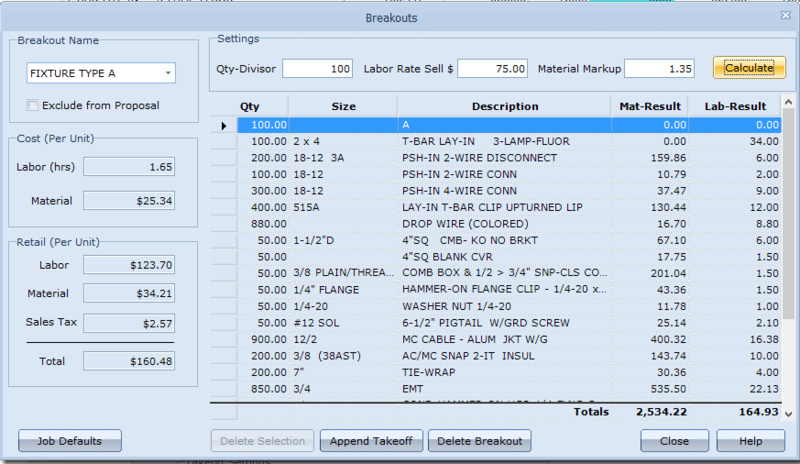 Retail (per unit) displays the material and labor cost of the breakout after factoring in your hourly rate and material markup along with the Qty-Divisor. Let’s take the Breakout process a step further. Say you determine that the breakout price for this fixture is $200. You will also want to set a Breakout Add/Deduct Percentage. For this example, we’ll set the percentage for 25% either way. That means that when Bid Recap calculates the add/deduct price, it will show that the cost to add a fixture is $250 or a $150 credit to remove a fixture. Regardless of whether the customer decides to add or remove any fixtures, either decision results in more work for the project manager. The breakout percentages are used to offset the cost of the additional work load when such changes are made. In fact, many contractors use a deduct price of $0 especially in the case of fixtures, because fixtures usually can’t be returned once they’ve been shipped; or if they can be returned, the restocking charge is typically cost prohibitive. If there are unknown factors at bid time, using the breakout feature can be very useful. For example, the site drawing shows a feeder from the Main Distribution Panel back to a Power Panel at the rear of the building. That’s a simple takeoff. But suppose the Power Panel location hasn’t been determined by the contractor yet. How do you measure from ‘Here’ to ‘There’ when you don’t know where ‘There‘ is?! Simply determine the closest area where the panel could be placed and use Breakout to determine the ‘per foot’ price. Be sure to include your estimate of the location of the box as a clarification in your bid letter so that there are no surprises if the length of the feeder ends up longer once the actual location of the panel is determined.